Wedding planning is hard work and hardly the most fun part about getting married. From deciding a on theme to deciding who (or who not) to invite, it can be a team effort. POPSUGAR Insights recently surveyed over 1,200 married or engaged POPSUGAR readers to learn how they planned for their big events. Overall, nearly half of women said that they spend more than 10 months planning their wedding. Nearly 70% of women said their wedding planning lasted more than seven months. Ninety-nine percent of women we surveyed were directly involved in their wedding planning, but they certainly weren't alone. Nearly nine in 10 partners (88%) were also involved in the wedding planning process, and other members of family, including the bride's mother (60%), the groom's mother (30%), and the bride's father (18%), were involved. 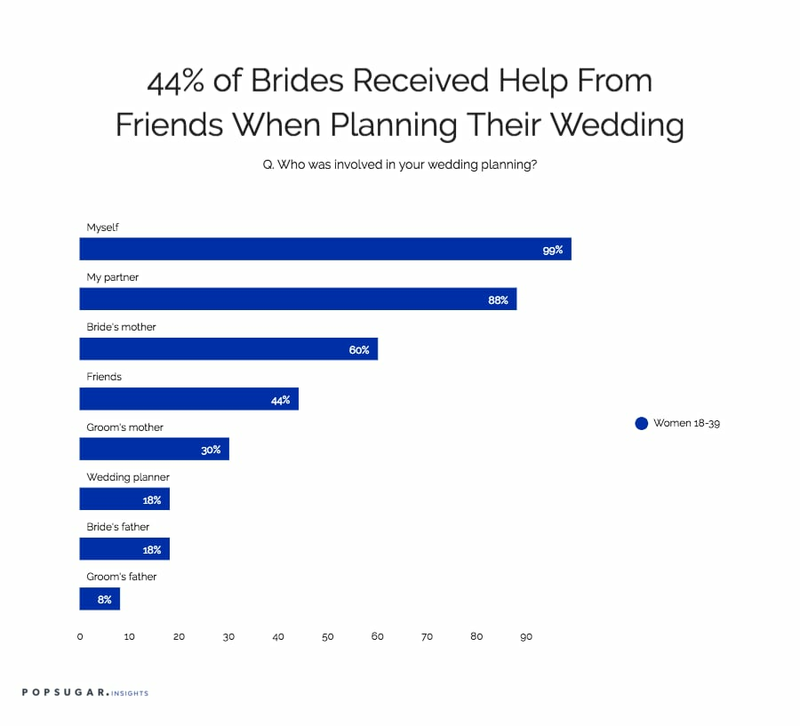 Only 8% of women said the groom's father was involved in their wedding planning, but 44% said that their friends played an active role in helping them plan their ceremony.